Stop press: 4 July! Chloe has been adopted by an understanding and patient owner! Just Dolly to go. Who will come forward to make her day? 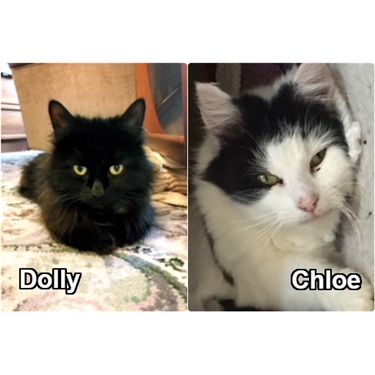 Dolly and Chloe are two of a kind – both abandoned young Mums whose kittens have flown the nest and are now desperate for a loving home of their own. Trouble is they’re not playing the obligatory‘I’m a really fussy friendly fabulous feline’ game (that’s the ploy canny cats use to get themselves adopted) – Chloe even had the cheek to give the vet a bit of a nip! And he only had her best interests at heart. Pure black Dolly looks mean, but it’s her way of seeking out someone who can read between the furry frown lines on her forehead and see her for the good girl she is planning to become – honest! *We're looking for two of a kind ... one for Dolly and one for Chloe!